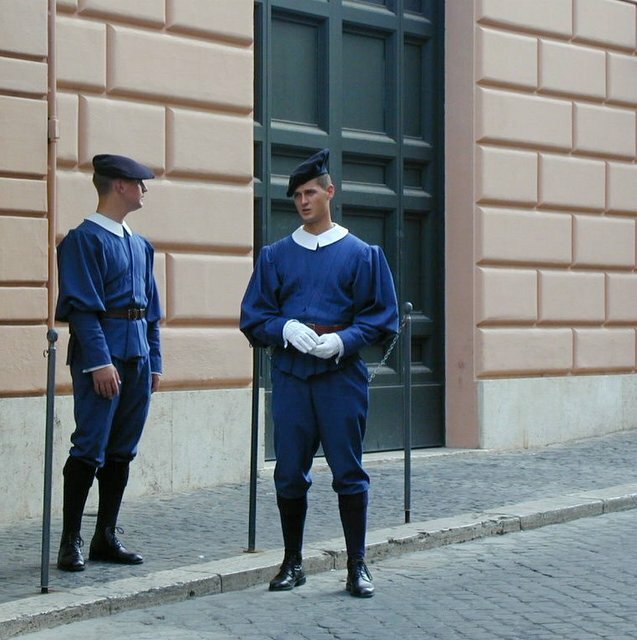 Read the history of the Swiss Guards here. 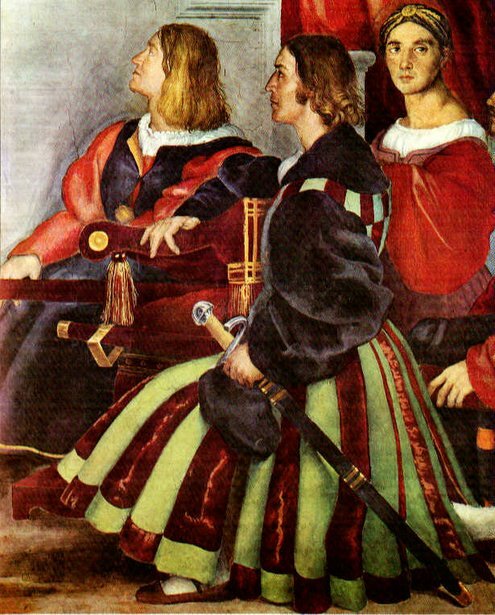 Swiss Guards depicted in a painting, genuflecting during High Mass. 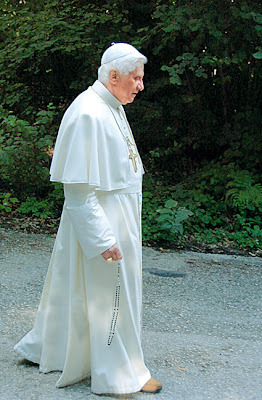 Traditional full dress uniform. Pleated gorget or throat-piece, white gloves, grey metal morion with ostrich-feather plume. 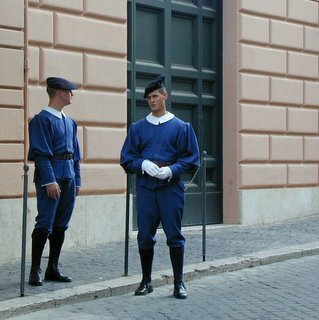 Contemporary uniforms: plain white collar and black beret. 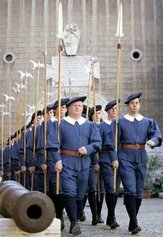 The main weapon of the Swiss Guards is the halberd. A halberd is a weapon that looks like an axe with a spear at the top and it sits on a long pole. Everyday uniforms or drill uniforms are all blue. They are so colorful! 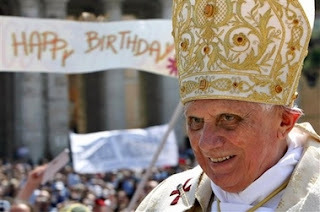 I have never paid attention before, so it's good that the Pope B has brought attention their way, and of course thanking them. 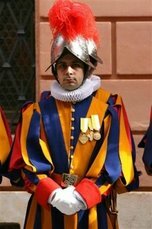 "Oh, my son is a Swiss Guard" or "I was a Swiss Guard in my youth". What a cool, cool thing! I wanted to say I love your picture of the Infant Jesus. It is beautiful and reminds me of the Christmas crib my mom has. 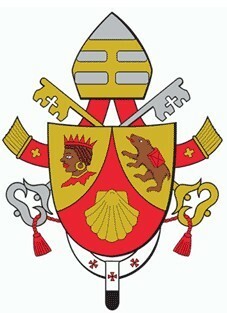 Carmel, the fact that they have protected the pope for half of a millenia is proof of Divine Providence. Yes, I like all the colors of their uniform and the blue one is especially synonymous with Our Lady's color. 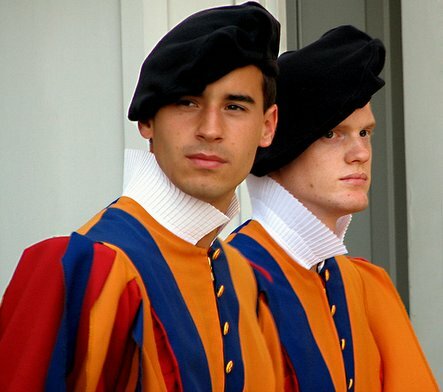 Anonymous, yes, that is most certainly cool to be able to have a son as a Swiss Guard! Or just to know someone is enough for me! 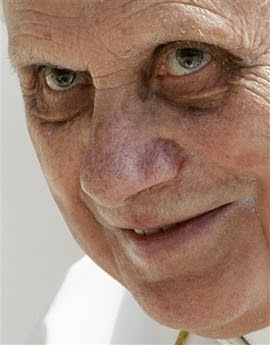 I wonder who their patron saint is? 4HC, thank you so much for the compliment. Baby Jesus inspired me to put Him there. God bless your mom to have a Christmas Crib like that.